As soon as you see this Winnie the Pooh costume, you’ll know an adventure is going to happen! There’s only one thing that’s better than doing Nothing. Whatever could that be? Well, we have the answer: it's going on an adventure in the Hundred Acre Wood at Halloween time in search some delicious smackerels to fill that “hunny” pot! But – oh Bother! We’ve just heard that there are some Heffalumps lumping along out there looking for goloptious full-up pots of hunny, too. How will your little one ever compete for all the sweets? Well, there can’t be just be lots and lots of scampering around and hoping for the best. You’ll need to make sure your toddler is the sweetest, friendliest, most lovable character on the trick or treating trail. So, here’s what we recommend. You’ll need to turn your toddler into Winnie the Pooh, that honey-loving stuffed bear, at once! We guarantee that once this Deluxe Winnie the Pooh Costume is on, the transformation from toddler to bear will be happily complete. The soft, yellow faux fur will be comfy and fluffy, perfect for chilly Halloween adventures. 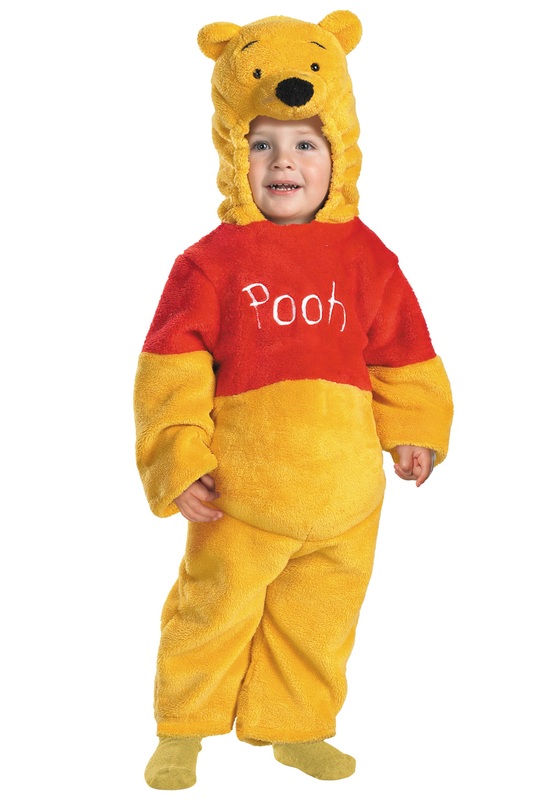 The jumpsuit-styled costume is easy to pull on, and it already has a red, short-sleeved shirt attached with “Pooh” embroidered on the front. So all you’ll need to do is have your little one jump on in, zip it up, and put up the hood with Pooh’s face. Then, get ready to get big-hearted Piglet to bravely f-f-follow, gloomy Eeyore to put on a smile, happy Tigger to bounce along, and how lucky your Pooh will be!